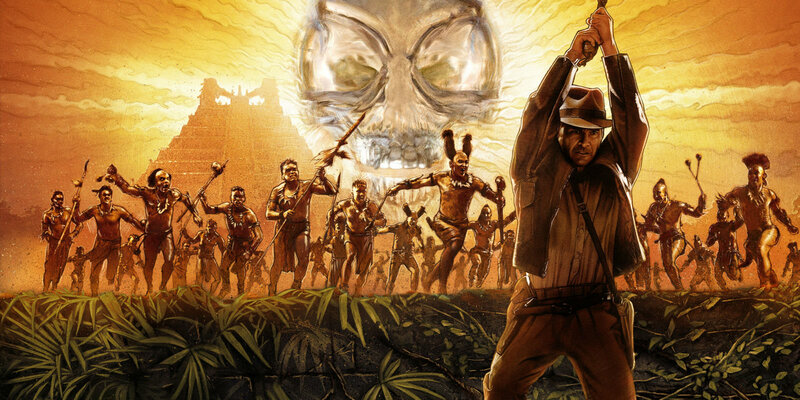 The Indiana Jones franchise remains one of the most-liked and respected adventure series in modern cinema. Taking its inspiration from adventure movies from the 30s and 40s, Steven Spielberg and George Lucas brought their love for these action movies to the big screen. Beginning with his introduction in Raiders of the Lost Ark in 1981, Indiana Jones became the model for adventure movies of that decade. His action adventure tales continued into Indiana Jones and the Temple of Doom, a prequel to the first film. The film pushed the boundaries of film ratings at the time, generating the creation of a new film rating because of it: PG-13. 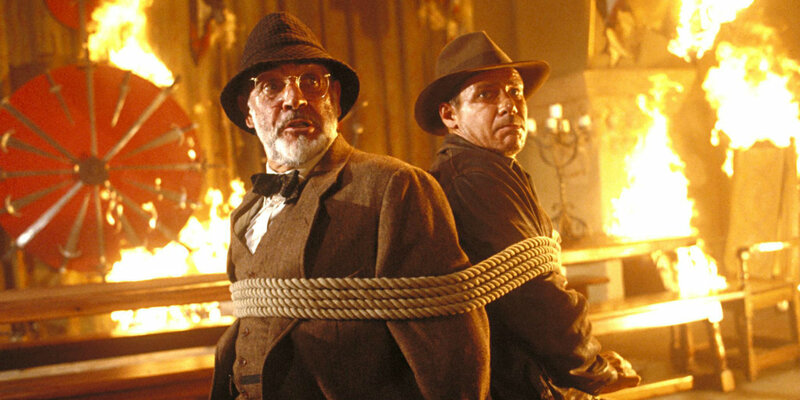 Indiana Jones and The Last Crusade brought audiences a peek into Indy’s past. Not only did viewers get a glimpse of a young Indiana Jones, but this adventure included Professor Henry Jones Sr., Indiana’s father. Though many felt the series ended with the team riding off into the sunset, the franchise was re-invigorated almost 20 years later with the release of Indiana Jones and the Kingdom of the Crystal Skull in 2008. Despite Ford’s age, the actor took on the role with as much vigor and excitement as his previous movies. Audiences watched as their favorite adventurer continued his journeys as a much older and wiser archeologist. The dashing professor/archeologist we have come to love almost took a very different form in the early stages of the character’s development. Starting as an idea developed by director Steven Spielberg while on vacation, his initial plans for Indiana Jones could have led to a more debonair leading man. Jones would be like James Bond but better, with Spielberg even planning for him to be an alcoholic. His writing partner, Director George Lucas, suggested a more scholarly vision for Jones, leaning more toward an adventurer vibe. Thankfully, Lucas’ vision won out in the end. Indy with no whip and fedora? No, thank you. The development of the Indiana Jones franchise began with the creative mind of Steven Spielberg. As he continued to develop the story, he reached out to good friend George Lucas to co-write the series with him. Initially stating it would be for three movies only, the two poplar directors began shopping their idea around to major studios. A simple task for two big-time directors, right? Not so much. As Lucas shared with Vanity Fair, “Raiders was turned down by practically every studio in town. They thought it would be a successful movie but didn't trust the budget: $20 million.” However, Paramount executive Michael Eisner finally agreed to a five-picture deal for the franchise. Your first thoughts at the mention of the character Indiana Jones immediately takes your mind to images of his iconic costume and, of course, Harrison Ford. Ford fully embodied the character and made him an indelible piece of pop culture. However, Ford almost did not get the role due to his past relationship with Lucas. Having already worked with Lucas on three projects, the director stated he didn’t want Ford to become “my Bobby De Niro”. Trying to avoid a situation similar to the frequent collaboration between De Niro and Martin Scorsese, actor Tom Selleck became the frontrunner, complete with costume and screen test. However, his obligation to Magnum, P.I. prevented his casting. The storylines of Raiders of the Lost Ark took cast and crew to many locations in Europe and The United States. For the filming of the scenes that took place in Egypt, they chose Tunisia as the location for their shoots. Unfortunately, filming had to cease briefly when the majority of the cast and crew got food poisoning. However, one lone member of the crew managed to survive thanks to his personal food stash: Steven Spielberg. Spielberg shared, "I never got sick there because I got the Sainsbury’s canned food," he recalls. "Spaghetti-O’s, pork and beans – whatever they had from Sainsbury’s in England, I just packed a steamer trunk of canned food." Smart man. Yes, it was unfortunate that the majority of the cast and crew got sick from the food in Tunisia. However, this unfortunate event did lead to one of the most iconic scenes in the film series. During the filming of Raiders of the Lost Ark, the original plan was for Harrison Ford to battle a skilled swordsman with his whip and eventually steal his weapon. Though the stuntman had prepared for months for the elaborate fight scene, Ford, still battling dysentery, couldn’t film for very long. Syfy.com reported that “Ford famously turned to director Steven Spielberg before the cameras started rolling and said, ‘Let's just shoot the sucker.’” Brilliant solution! The fearless Indiana Jones faced off against evildoers and angry tribesmen in Peru with little fear (well okay, he was scared at times). However, nothing could take down the near-fearless adventurer quite like snakes. His dislike for the creatures came to a head when he was forced to enter The Well of Souls in Raiders of the Lost Ark. Interestingly, the truth behind the filming of the scene would have actually put Indy’s mind at ease a little. The scene required 7000 snakes to be used for the scene. However, as reported by NY Daily News, the majority of the creatures were nothing but legless lizards. Not scary at all. One of the funniest and most talked about moments from Raiders takes place between Indy and Dr. René Belloq (played by Paul Freeman) when a fly landed near Freeman’s mouth and went in. However, the fly never comes out, leading fans to believe he simply ate it. Freeman addressed these rumors, dispelling the fly-eating act as film trickery. In an interview during the 2003 Collectormania 3 Convention, he stated, “…[I]f you freeze the frame around that point, you’ll see that actually some frames are missing. Yeah, I think they just took out a couple of frames when the fly flew off, just to make the joke.” The fly actually came back out! Years ago, rumors circulated of a blooper reel that occurred during the whipping scene in Indiana Jones and the Temple of Doom. However, footage was finally recovered by JoBlo of the hilarious prank played on Ford which included several members of the cast and crew of his previous films and a powerhouse singer/actress. SlashFilm.com reported, "Director Steven Spielberg wanted to play a practical joke on his star, Harrison Ford, while filming a scene where Indy is captured by the Thuggee. Spielberg got [Barbara Streisand] to dress up and whip him. Then, the story goes that Carrie Fisher popped in with Empire Strikes Back director Irvin Kershner.” Complete insanity! Spielberg never cared for Temple of Doom due to its very dark material. He elaborated in an interview for The Making of Indiana Jones and the Temple of Doom: The Documentary his true feelings for the film. TheShadowLeague.com reported that the director said, "Temple of Doom is my least favorite of the trilogy. I look back and I say, 'Well the greatest thing that I got out of that was I met Kate Capshaw.’ We married years later, and that to me was the reason I was fated to make Temple of Doom." At least one good thing came out of the film, right? One of the most memorable scenes from Temple occurred with that ill-fated heart removal. The scene, considered very graphic at the time, was supposed to be even worse! In an interview with Yahoo Movies, actor Nizwar Karanj (who played “Sacrifice Victim”) shared details about the original intentions for the gruesome scene. He recalled,“Actually, they made a lifelike face of mine for the film, including glass eyes. That was because, once the cage was lowered into this pit of molten lava, my body would disintegrate and you would see my face floating. But that scene was too gory for the censors, so they cut that!” Wow. The movie, along with the film Gremlins, led the MPA to create the new rating of PG-13. Spielberg later shared, “…I've always been very proud that I had something to do with that rating." Thanks to a recommendation from Harrison Ford, the part of Young Indy in Indiana Jones and the Last Crusade went to River Phoenix. Through the opening sequence, audiences got a glimpse of the young adventurer tackling bad guys and recovering artifacts as a teenager. He became one of the first actors to portray the hero in his youth. In fact, his portrayal was so impressive, Lucas decided to create the television series The Young Indiana Jones Chronicles in 1992. Thanks to his inspiration to include some of Indy’s history into the film, the series based on his youth became critically acclaimed and beloved by Indiana Jones franchise fans. The series lasted three seasons on ABC. The 007 connections continued with their use of actors from the film franchise including such stars as John Rhys-Davies, Julian Glover, and Michael Byrne. In the beginning, the idea for Indiana Jones began between two friends for a simple trilogy. These three movies soon branched out into a 5-movie picture deal with Paramount. However, by the second movie, Spielberg had already begun expressing his regrets for the franchise’s direction. So with the making of The Last Crusade, Spielberg hoped to resolve several lingering issues from his past. Entertainment Weekly reported that “In 1988, he claimed that he made the following instalment, Indiana Jones and the Last Crusade, largely ‘to apologize for the second one… It was too dark, too subterranean, and much too horrific.” The third movie would also complete his original deal with Lucas. Two resolutions in one! In the end, the story moved to tales of the Holy Grail and a shared adventure between father and son. Let’s be honest: when the announcement of Indiana Jones and the Kingdom of the Crystal Skull came out, we all thought the same thing: Ford was too old for the movie. Despite the hesitations about his age, Ford decided he wanted to not only pursue the role but make light of what everyone was already thinking. He declined to dye his hair, and he even encouraged adding some jokes about his age in the script. According to the book The Silvering Screen: Old Age and Disability in Cinema, Ford stated, “The appeal of Indiana Jones isn’t his youth but his imagination, his resourcefulness.” Indy is still Indy, just in an older body. n preparing for the film, Ford began training daily for several hours and taking on a diet of high-protein and vegetables. He also insisted on doing most of his own stunts. Ford commented,“ My ambition in action is to have the audience look straight in my face, and not the back of a stuntman's head. I hope to continue that, no matter how old I get." Though his thorough training prepared Ford for the movie, the studio still had to consider his age. Although they allowed him to do most of his stunts, they were still hesitant about letting him to do some stunt work on his own. In considering the safety of the actor, Paramount initially advised Ford that for The Crystal Skull, the famous whip would be added in post-production. A fake whip for Indy? Sounds ridiculous, right? In preparing for the fourth film for the Indiana Jones franchise, several movie ideas were tossed around for years. Considering the standard format of Indiana Jones and the _______, several of the failed titles were quite hilarious. Included in this list of rejects were “City of Gods”, “Destroyer of Worlds”, “Fourth Corner of the Earth”, “Lost City of Gold” and “Quest for the Covenant". Even before these Lucasfilm registered titles, a few of the old titles actually became a part of the storyline. Thanks to their brainstorming, he saw elements of “Saucer Men” and “Attack of the Giant Ants”. Spielberg has always been a big supporter of his good friend George Lucas. 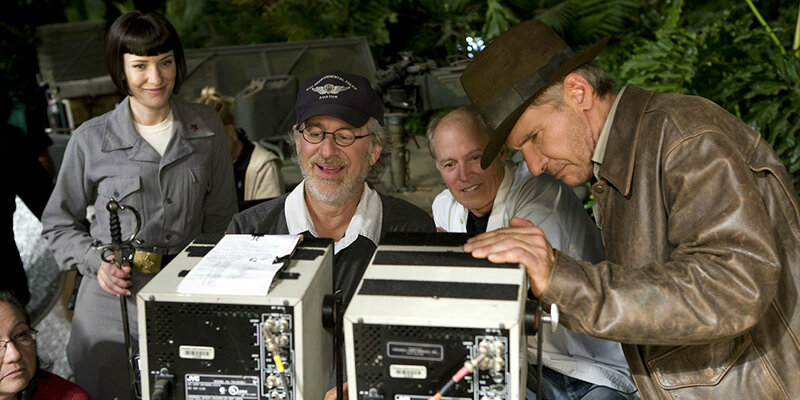 In an example of their close friendship, Spielberg explained to Empire Magazine how he considered their friendship during the making of Crystal Skull. He said, “I sympathize with people who didn't like the MacGuffin because I never liked the MacGuffin. George and I had big arguments about the MacGuffin. I didn't want these things to be either aliens or inter-dimensional beings. But I am loyal to my best friend. When he writes a story he believes in - even if I don't believe in it - I'm going to shoot the movie the way George envisaged it.” True friendship indeed. The process to develop the script for the fourth movie took slightly longer than anticipated. Well, 19 years to be exact. During that timeframe, numerous ideas floated between Lucas, Spielberg, and Ford but none of them could agree on the best direction for Indy. Multiple scriptwriters tried to take their shot at the movie as well, including M. Night Shyamalan and Frank Darabont. Unfortunately, they both became too invested in their own projects to continue. However, a particular statement from Harrison Ford may have been the motivation to make some concrete decisions. As reported by The Los Angeles Times, in 2005 Ford gave a deadline that the movie had to be completed by 2008. Many fans were disappointed with the fourth installment, Indiana Jones and the Kingdom of the Crystal Skull. Audiences weren’t fans of the film taking an alien-themed storyline, a plot that has popped up in many of the creators’ combined film catalogs. With the announcement of the final installment in the five-picture deal, fans expected Crystal Skull to be removed from canon. Sadly, that is not the case. According to DigitalTrends.com, “As for the content of the story, franchise producer Frank Marshall has indicated that the fifth movie will be a continuation of the events following Kingdom of the Crystal Skull, rather than any sort of reboot or prequel.” Crystal Skull is indeed canon. One of the best aspects of Crystal Skull, however, continued to be the nostalgic feeling of revisiting people from Indy’s past. The return of Marion (the female lead from Raiders of the Lost Ark), made many Indy fans very happy. Though Harrison Ford remains as the only confirmed cast member for the new film, a few past Indiana Jones franchise actors wouldn’t mind revisiting their characters for the movie. Both John Rhys-Davies and Karen Allen expressed interest in returning for the film. Even composer John Williams is on board to return (his eleventh film with Harrison Ford as a lead actor). However, Shia LaBeouf will not be back to reprise his role. Details about the new movie have been very scarce, with only a few details concerning possible cast and crew reveals. Given this is the end of the original deal with Paramount, some Indiana Jones fans may be concerned that this marks the end of the road for their favorite adventure. Considering how one of Ford’s other beloved characters met his end, we are all a little anxious (and still heartbroken). However, Spielberg did share this one spoiler with The Hollywood Reporter: "The one thing I will tell you is I'm not offing Harrison [Ford] at the end of it." Production of the final installment of the Indiana Jones franchise has suffered a few setback and changes so far. For starters, Crystal Skull co-writer David Koepp was replaced by Jonathan Kasdan to write the screenplay. However, according to Variety, additional delays have caused the movie to miss its intended 2020 release date. They reported, “Filming was supposed to begin in April of 2019 in the United Kingdom, but sources close to the production say that shooting will no longer start next spring and will have to be pushed back by months, if not a year. Potential crew members have already been informed of the delay.” Here’s hoping Indy makes his return by 2021. Fingers crossed! What do you say, Indiana Jones fans: Did we miss any interesting bit of trivia? Let your voice be heard in the comments section!